For the past few years there’s been a great deal of buzz about this small company called Elio, who promises to produce a small three wheeled vehicle capable of 84mpg, and costing only $6,800. Opinions have ranged from “This is the best thing since sliced bread” to “This is nothing but vaporware.” I have to admit that my own opinion has typically leaned more toward the latter. I liked the idea, but it seemed too good to be true. That’s why when I saw that Elio would be at NYIAS, I made it a point to take a look for myself with an open mind. After seeing Elio’s final prototype, sitting inside it, and speaking with CEO Paul Elio himself, I’ve changed my mind. Not only is this a viable concept, I think enthusiasts like us would enjoy driving one as well. Much has already been written about Elio, so I’ll just summarize here. In 2008, when gas prices hit their peak, Paul Elio got mad and decided to do something about it. He put his background in auto design to work to create not only a highly fuel efficient car, but one that would be cheap to own and operate as well. Most people commute alone, so the car would be sized for one, or two in a pinch. This allowed everything to be downsized, and even drop a wheel in the process. This causes the Elio to be classified as a motorcycle rather than a car, making it exempt from crash testing and other expensive requirements. Unfortunately this would also require a motorcycle license, even though it drives just like a car. But Elio has lobbied successfully to create an “autocycle” classification for themselves that would allow people with a regular driver’s license to operate the Elio, since it drives just like a regular car. Many individual states have already recognized this category, and federal legislation was proposed earlier this month. Early prototypes were powered by the 3-cylinder motor from a Geo Metro, but Elio has now built their own 900cc motor, producing 55hp and 55lb-ft of torque. That doesn’t sound like much, but when you consider that the entire vehicle only weighs 1,228lbs, that’s a pretty good power to weight ratio. It beats the economy minded 1991 Honda CRX HF, which only made 62hp to move its 1,966lbs. The Elio won’t win many drag races, but with a top speed over 100mph and a 0-60 time of 9.6 seconds it’ll keep right up with traffic while getting up to 84mpg on the highway. With an 8 gallon tank, that’s a 672 mile range. That’s more than enough to drive from my home to the Javits Convention Center where NYIAS took place and back on a single tank. My Subaru BRZ needed to fill its much larger tank once each way. The interior is quite simple, like cars used to be. But it’s not without creature comforts, either. It comes with air conditioning, and above the shifter there is a holder and plug-in for your tablet to become your infotainment system. Speaking of the shifter, here’s where enthusiasts like us can rejoice. Though an automatic will be available, the standard transmission is a 5-speed manual by Aisin with a particularly sporty short shifter. The steering wheel feels rather sporty as well, and the seat is comfortable but supportive like a sports car. Sitting inside the Elio, I felt like I was in the cockpit of an X-Wing fighter. The front track is as wide as a normal car, but the rest of the Elio is quite narrow. I imagine I would have to get used sitting in the center of my lane instead of the left side, but that wouldn’t be difficult. If it’s good enough for a McLaren F1, it’s good enough for the Elio. Take a look at that double wishbone front suspension. That’s an excellent design, used on many proper sports cars and race cars. The older Honda Civics were renowned for their awesome handling because they used this type of suspension as well. Though the Elio’s body is tall and narrow, the center of gravity is low, and this suspension most likely helps keep the car well planted in the corners. But how well planted can a car be with only three wheels? Ask Morgan. They’ve been making three wheeled sports cars for over 100 years, and though they’ve made some models with wheels on all four corners, the modern Morgan Three-Wheeler is a riot for any enthusiast to drive. You don’t need four wheels to have fun. But how much fun can you actually have with it? Obviously I’d have to actually drive one to know for sure, and Elio isn’t willing to allow that until they’re absolutely certain all of the safety features are working properly. This is still a prototype, after all. By my estimation, though, the Elio could be a lot of fun in a “slow car fast” kind of way. You will never forget what you’re driving, as both the left and right sides of the car are right next to you. The shifter feels great, and weighing half as much as a Miata I’d imagine it must feel quite responsive. Being able to actually see the front wheels means you can practice hitting your apexes with absolute precision, even at legal speeds on the street. Could you take your Elio to your local autocross or track day? All automotive sanctioning bodies that I’m aware of currently prohibit any vehicle with less than four wheels. But since the Elio is technically a motorcycle, perhaps it could join some motorcycle track days to prove the point. 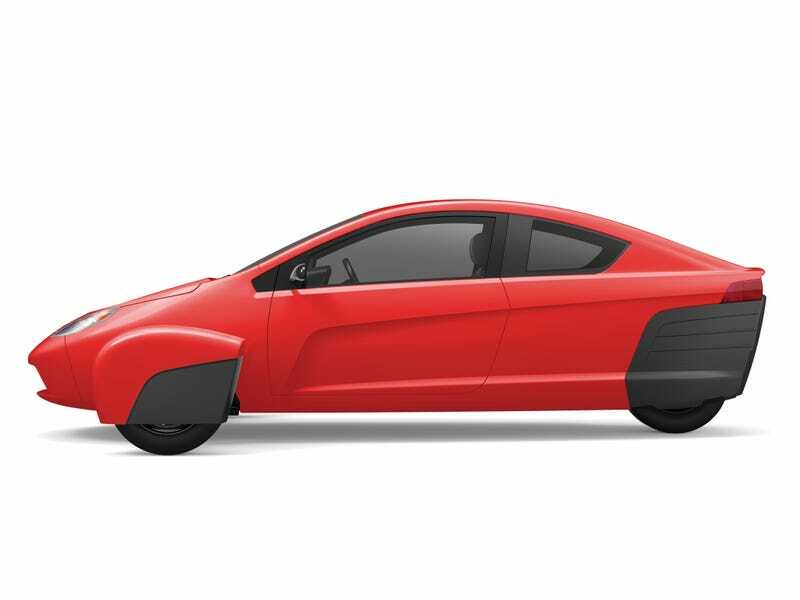 Driving the Elio in a spirited manner may sound like it defeats the purpose of an economical commuter car, but Paul Elio already has exactly that in mind. Speaking with him at NYIAS, it became clear that he’s an enthusiast like us. In the past he’s owned a Mustang convertible, Saab 900 turbo convertible, and a couple of Corvettes. When we asked him what he thought about people racing Elios, he already had an Elio racing series figured out. The rules would be very simple. Everyone starts out with a bone stock Elio. From that point on, there are no rules. Elio believes that creativity and innovation have been squashed out of every major racing series due to rules and regulations. Races are won by finding loopholes in the rules and not getting caught cheating, rather than with fresh ideas like 1969 Dodge Charger Daytona’s controversial and highly effective nosecone and rear wing. Of course, there is a catch. The winner of the Elio racing series would then be required to sell 10,000 packages with all of the parts needed to duplicate their winning setup for $10,000. This, rather than heavy handed restrictions on what you can and can’t do, would keep costs down, and steer the designs toward ones fit for affordable mass production. While more expensive than LeMons or ChumpCar racing, it would be far less expensive than NASCAR, Indy, IMSA, or any other professional racing series. And personally, I’d love to see a pack of modified Elios power sliding their way around a road course. I might even want to buy an Elio and race winning modification package for myself. There’s enough room under the hood to fit a powerful sportbike powerplant in there, which could more than double the power and add a sequential shifter. Elio’s next step toward production will be to build 100 pre-production cars for final evaluation and testing. They plan to begin full production next year and start delivering cars to the 51,286 customers who have already reserved one at the time of this writing (there’s a running tally on Elio’s web site). Many have been critical of whether the company will actually be able to follow through on these deliveries. I have been among them myself. But seeing is believing, and after seeing the P5 prototype I’m optimistic and hope that Elio pulls this off despite the naysayers.